This period is called the Romantic period because such writers as Keats, Shelley (his wife wrote Frankenstein), Byron, Austen, and composers such as Brahms and Tchaikovsky wrote and composed based on emotion and adventure and exhibited artistic freedom. . It was also the restoration of the short lived monarchy (1814-1830) in France. This is a continuing period of progress in industrialization and trade with the further development of the railways and fast transportation. The appearance of cheap press, modern advertising, and fashion magazines all produced major changes in the economy, social life, and in fashion. Fashion Plate published in a ladies magazine. New advances in the textile industry enabled more people to buy fabric at affordable costs. The cotton industry, woolen industry, textile printing, and weaving were all impacted by technological improvements. The manufacturing of clothing was changing as well. Although the majority of garments were made-to-order, there were emerging signs that the mass production of clothing was on its way. Tailors, for example, no longer received their materials from their customers but bought their own. Many tailors pre-cut and sewed part of the pants for sailors who did not have sufficient on shore time to make an entire garment from scratch. The role of the woman changed again in this period. During the Empire many women took on public roles, but they suddenly went back to the house and became more involved with the household matters. They had time to indulge in making themselves into butterflies with ribbons, trims, laces, and corsets. The corset emerged again developing into the wasp waist (remember Crete?). Some men wore corsets under their shirts as well. (The number of patents for corsets in 1828 was 2. That number increased to 64 by 1848.) The ideal body shape was the hourglass figure. While the fashions of the time were extremely feminine, romantic, and ephemeral, there were those who had the freedom and self-security to do the opposite. One such person was George Sand, a female author, who took on a man’s name and wore trousers in an effort to strike a blow at feminism and, it is imagines, for publicity. Her actions and the actions of a few others were the beginning of the woman’s rights movements which came about in more force at the beginning of the 20th century. Department stores developed. Prior people bought their goods from specialists such as the meat vendor, the fabric vendor, the cobbler, etc. While the development of the department store does not radically change consumption at this time, it will eventually. The evolution of women’s costume from Empire to Romantic is a good example of a slow evolution. Those costumes between 1815 and 1825 will be called “transition costumes”. There are three areas to take note of: the shoulders, the waist, and the hem. 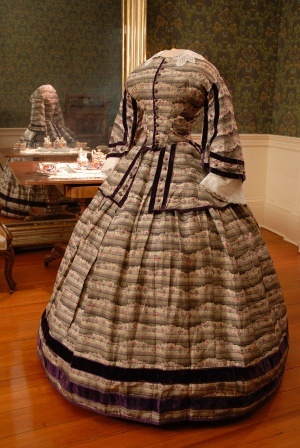 The woman’s dress in Figure 8 is called the Restoration Costume and it consists of a bodice with a boat line neckline that ended off the shoulder; large puffy sleeves, a tiny waist that was just a bit higher than the natural waistline, and a very full skirt that was short enough to display tiny feet. The garment is made from light weight and generally pastel colored fabrics and prints and is embellished with ribbons and bows. As women changed their attire often so it would be suitable for their activities, the dresses were called “morning dress,” “tea dress”, “walking dress,” etc. The pelisse is a coat dress and is made to keep the wearer warm, but looks like a dress. Both the wide shoulders and the wide hem emphasized the smallness of the waist. Necklines were further emphasized by pelerines and other neckline devices. Sleeves are of paramount importance in this period. Generally they are called gigot sleeves, but had all kinds of other names: Marie, Imbecile, elephant ears, and many other names. They were quite often double layered with a sheer sleeve over the solid one, they could be gathered, they could be full at the top and narrow at the bottom, they could be gathered like virago sleeves, they could be cut to the wrist, the elbow, or shorter. Tortora and Eubanks have some excellent illustrations. A bridal dress from the period. Sleeves are full on top and narrow at the wrist. Note that the sleeve does not start at the shoulder but is dropped and starts a few inches down the arm. This is an important characteristic because in the Late Victorian period this large sleeve will be seen again and will start at the shoulder/arm juncture. They did not have zippers but relied quite heavily on cords and ties. The hairstyle, Apollo Knot, is a strong characteristic in identifying the Romantic period. It was composed of piling the hair on top of the head in a large knot or bow-like form and adding ribbons. Apollo knots were often worn with hats. The use of lace in the hats was typical. Figure 16. Portrait of a woman in a bonnet or hat. Again note the lowered shoulder/arm seam. The dropped or lowered shoulder/arm seam made it difficult to raise one’s arm, especially if it were fitted a tight as this one is. Therefore it would be difficult for these women to do many kinds of physical work. Ladies in afternoon dresses from cotton prints, and wearing bibi bonnets. These had a front rim that helped protect their faces from the sun. The textile industry was booming during the Romantic period so many kinds of textiles could be produced. The fashionable textiles were the light weight ones: silk taffetas, cotton voiles, cotton calicoes, cotton batistes, wool challis. While solid colors were used generally in pastels, small prints were popular as well as plaids. Corsets were worn as well as undergarments that gave shape to the structure of the sleeves and the dresses. The men’s costume silhouette did not change much throughout the 19th century. They continued to wear the frock coat and it did take on some variations. They continued with the waistcoat or vest, the shirt, the cravat and the breeches or trousers. A tight fit was fashionable as well as a small waist. Man in blue frock coat, yellow waistcoat, red cravat, white breeches and a top hat. Note that the breeches have a strap or stirrup that attached to the hem of the leg went under the foot instep and to the other side of the hem. This kept the pant leg smooth and tight. The “stirrup” pant was revived in the 1960s and used for woman’s pants. This would be the extreme of fashion of the day, not generally worn by all men. The common man wearing a frock coat, waistcoat, breeches. The top hats are a bit shorter. The intricate patterning and fitting of the frock coat is evident from the center figure. Boots and shoes were worn. Canes were a popular accessory. Not only was this period called the Romantic period because of writers, composers, and art, this period was also romantic because of their clothing. Corsets were still popular during this period, the hour glass shape was ideal for women and men encouraged it. Shoulders were also exaggerated along with the tiny waist. The Apollo Knot was a strong characteristic for this was when women would gather their hair at the top of their head in a large knot or bow-like form and add ribbons. The tying of the hair gives a sense of romantic feel for the neck and back may be more visible. Due to more advanced technology, fabrics became more refine. Silk taffetas, cotton calicoes and lace as lightweight fabrics were used. Lace was more used on items such as the bibi bonnets to give a more feminine look. 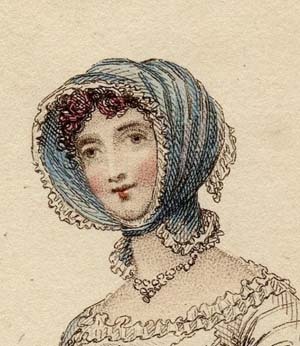 The bonnet was an item I thought was unique because it added to a woman’s feminine look. Colors such as pastels were used to give a more soft touch to the womanly bodice. As for the men’s costume, the frock coats still existed and continued to wear tight fitting clothes with small waists and a cane as an accessory.